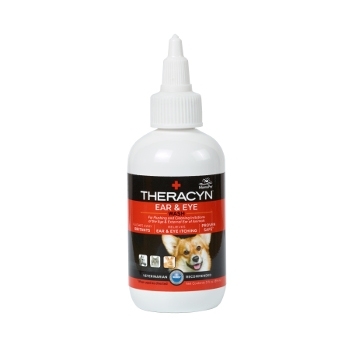 Provides easy clean up and helps with odor control. 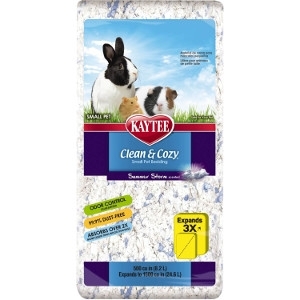 Kaytee Clean & Cozy Summer Storm scented small pet paper bedding gives you a whole new standard in super-soft, absorbent bedding. 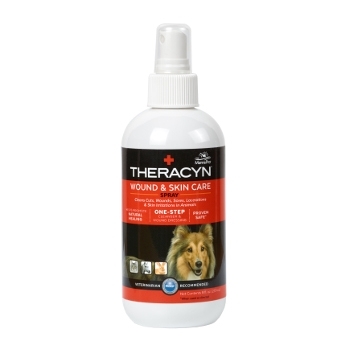 Clean & Cozy is soft and fluffy to encourage burrowing or nesting while absorbing two times more liquid than wood shavings. Clean & Cozy's absorbency means less odor. 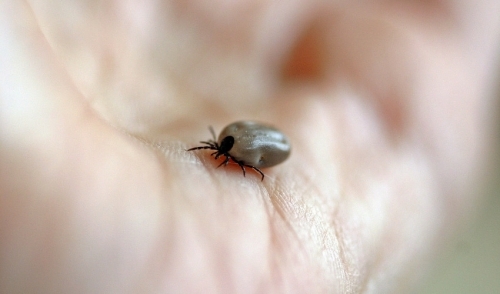 That's why Clean & Cozy has an odor control guarantee. 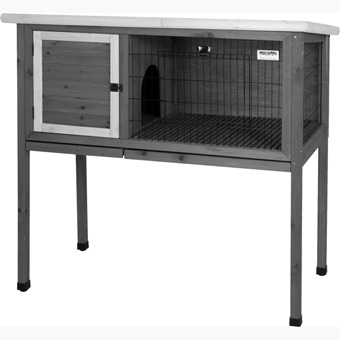 Plus Clean & Cozy is 99% dust free for a cleaner cage. Kaytee Clean & Cozy Birthday Cake Bedding, 500 cu. in. 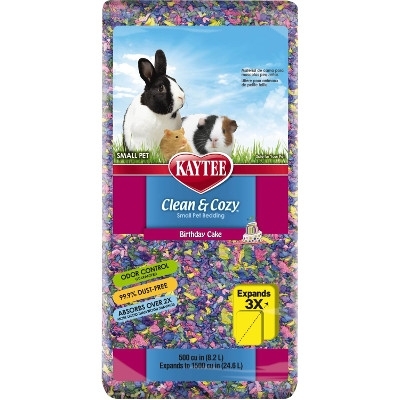 Kaytee Clean & Cozy Birthday Cake small pet paper bedding gives you a whole new standard in super-soft, absorbent bedding. 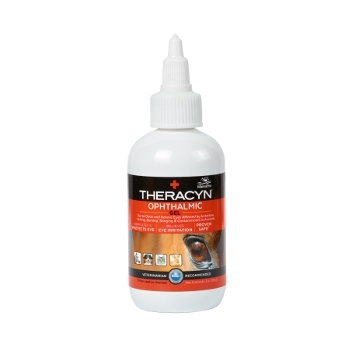 Clean & Cozy is soft and fluffy to encourage burrowing or nesting while absorbing two times more liquid than wood shavings. Clean & Cozy's absorbency means less odor. That's why Clean & Cozy has an odor control guarantee. 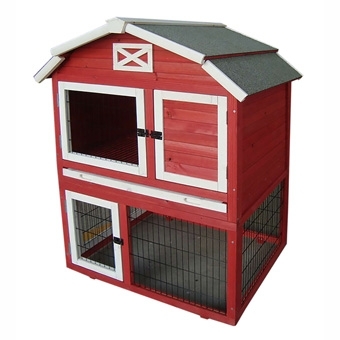 Plus Clean & Cozy is 99% dust free for a cleaner cage. Clean & Cozy Birthday Cake bedding comes in fun colors to add variety to your pets home. 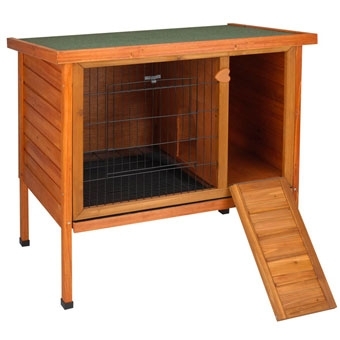 Asphalt Weather Protect Roof, Easy To Clean Slide Out Pan, Wooden Grate Floor, Ramp Door closes play area off from the hutch. Easy To Assemble. 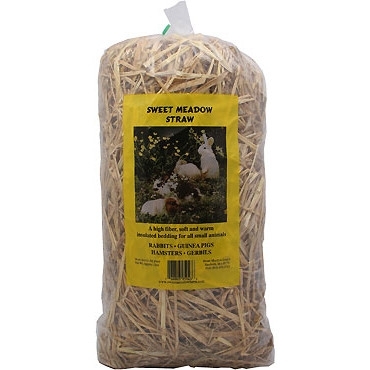 Sweet Meadow Bedding Straw, 15 oz. 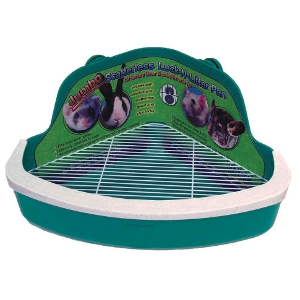 A high fiber, soft and warm insulated bedding for all small animals including Rabbits, Guinea Pigs, Hamsters, and Gerbils. 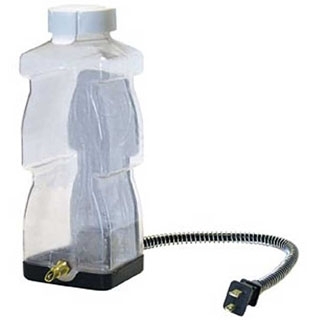 Heated Water Bottle for Small Animals, 32 oz. Designed for rabbits and other small animals the Farm Innovators Inc Heated Water Bottle 32oz keeps water from freezing during the winter. Features a durable plastic bottle that holds 32oz of water, with a flip up lid allowing for easy filling from the top. Contains a brass, no-drip drinking valve. 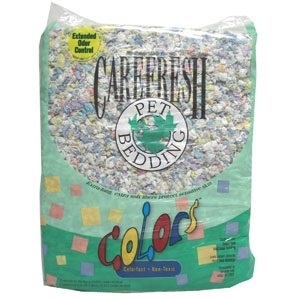 CareFresh Confetti Colors Small Pet Bedding provides your small pet with colorful earth-friendly bedding. 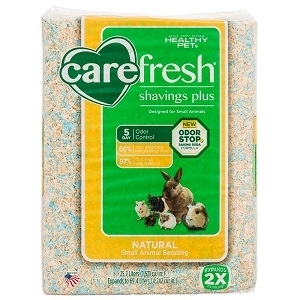 CareFresh Confetti Colors Small Pet Bedding contains no pine or cedar oils and is perfect for your rabbit, guinea pig, gerbil, hamster, rats, and other small pets. CareFresh Confetti Colors Small Pet Bedding Features is also free of the aromatic hydrocarbons found in pine and cedar shavings. CareFresh Confetti Colors Small Pet Bedding is the perfect way to brighten up your cage! Northeastern Aspen Shavings 4 cu. ft.
10% Carefresh Colors Blue Soft Bedding With 90% Softwood Shavings, With Odor Control Bits To Suppress Ammonia. 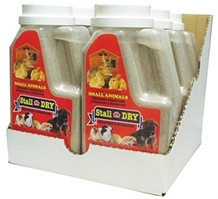 Has Natural Wood Shavings Plus Soft Bedding Bits For A Cozy and Absorbent Blend For Your Pets. 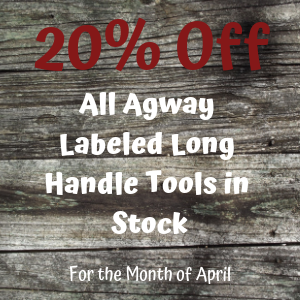 Non-Toxic and Low Dust, Softwoods Are Kiln-Dried To Reduce Aromatic Hydrocarbons. Absorbs 2.5X Its Weight In Liquid; More Comfy Than Just Shavings. 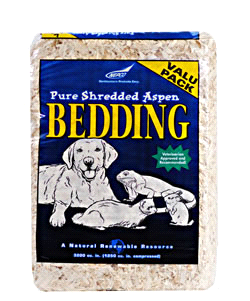 Soft Bedding Promotes Natural Behaviors Like Burrowing and Nesting, While Providing Warmth For Sleeping. 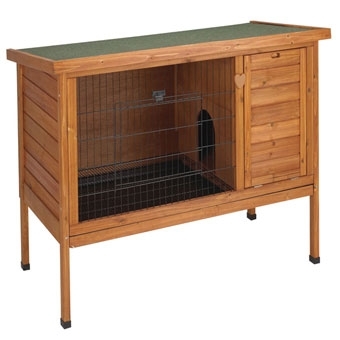 Premium PLUS Rabbit Hutch provides the highest quality home for your pet rabbit. Waterproof shingle roof lifts up for easy access. Plastic pan is easy to clean. Assembled in minutes with only a screwdriver. Rabbit approved Hop-Way door included. 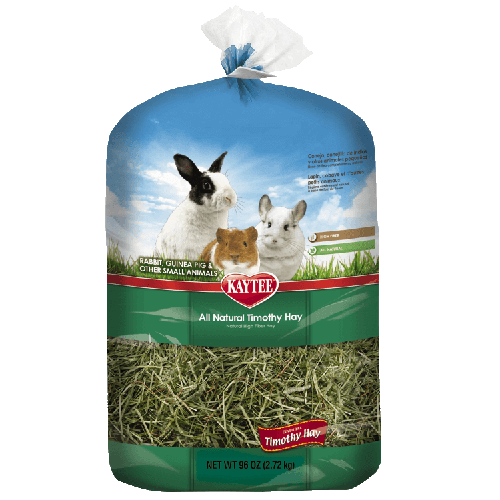 Kaytee Timothy Hay for Small Animals, 96 oz. Kaytee Timothy Hay is hand selected to ensure the long fiber strands and proper leaf to stem ratio to support digestive health. Kaytee Timothy Hay is grown in the ideal ecological location for moisture and climate control and is then stored in a protected environment to ensure the quality and superior nutritional value are maintained.